Caribbean Pools offers many Pool Water Features! Our pool water features include waterfalls, fountains, slides and more! Caribbean Pools specializes in building custom swimming pools with custom pool water features. From a rock waterfall to backyard water slides, we can do it all! For more ideas, or to check out some of our recent work, visit our gallery. No matter what kind of water feature you are looking for, Caribbean Pools is here to help turn it into a reality. Caribbean Pools has been successful in the pool business because of its commitment to providing the best design and quality in the pools it builds and providing outstanding service to every customer. Today Caribbean Pools consists of several divisions, all with a focus on the swimming pool industry. 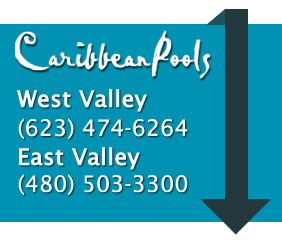 Caribbean Pools is the only swimming pool company to offer the depth of service to meet virtually every swimming pool need. Give us a call or contact us today to learn about the custom Pool Water Features available and how to get started!